Daytona has changed, folks. We need to look at it a little differently from here on out. The circuit has undergone quite a few changes, as the old design was more of natural track with long lap times, ruts, braking bumps and square edges. Today’s setup looks more like a traditional supercross. There’s some buzz right now over lap times going over a minute this weekend, which will give us twenty riders and twenty minutes. But I can remember watching a 30 man Daytona main event being roughly around 35 minutes! It was a real test of both speed and fitness, and that’s why names like Hannah, Stanton, Keidrowski and Carmichael won so much at the fabled car track. It just wasn’t a true supercross. Nowadays a different crew builds the track. Carmichael lends his assistance for the layout, and it’s built by a man who surprisingly never won Daytona, three-time AMA 125 National and one-time AMA SX Champion Mark Barnett. Today’s Daytona features much shorter lap times, a 20-man main event and is now closer to last week’s Atlanta SX then we have ever seen before. The teams all run their supercross set-ups, the ruts aren’t as deep anymore and the races are run at night, not under the hot sun like it used to be. So using the old criteria of who’s a great motocross rider or who’s in the best shape doesn’t work so much anymore. So in looking at Daytona now, who’s going for the W this Saturday night? 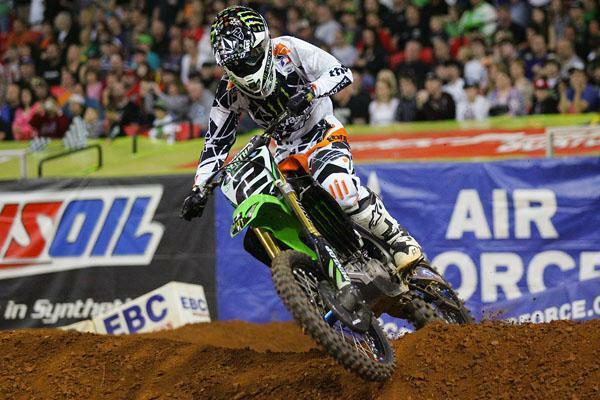 Can Villopoto make it two in a row at Daytona? Last year Ryan Villopoto won the race pretty handily and that wasn’t really much of a surprise. Although he’s been hurt and hasn’t been able to race much outdoors on a 450, RV can ride the berms, as his three Motocross Lites titles attest to. He’s rides with the rear of the motorcycle, he uses the throttle for control and simply wicks it on coming out of the turns. There’s a lack of precision in his riding, which is something that Daytona suits. How will Stewart rebound after a crazy race in the A-T-L? 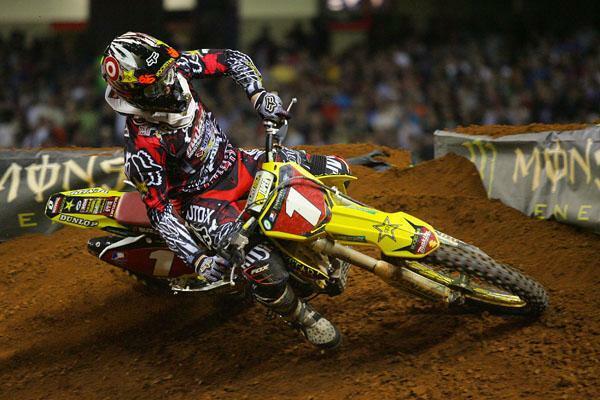 James Stewart has won Daytona once (2007), but has also had a tough time at the track with an ugly first turn crash in 2009, and in 2006 he went flying over a berm and somehow did not get hurt. So there have been highs and lows for JS7 at the oval. He’s the most creative rider out there and when Daytona does get some square-edges and chop in it, Stewart’s the man who can look at something and figure out a different rhythm to save himself from an impact. Reed has had success at Daytona, will this year be any different? 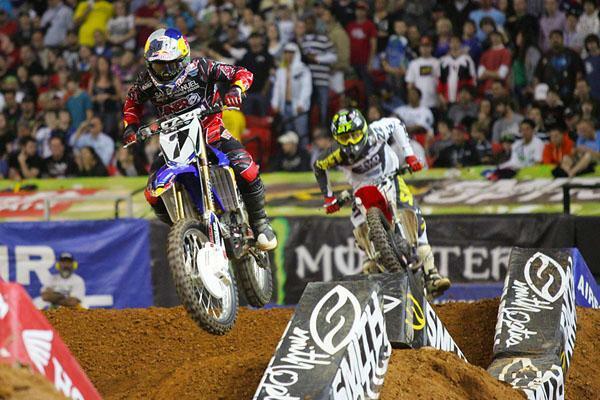 There’s something about Daytona that Chad Reed loves, no doubt about that. Last year he came out rusty (Daytona marked his return to the scene after his Phoenix crash, and he was nursing a newly-cracked thumb from a crash days before) and still set the fastest time in practice. The pits were buzzing with anticipation of the main event, but he determined he wasn’t ready and parked the Kawasaki after practice. Reed has won Daytona three times and probably should have a fourth if it wasn’t for his Yamaha getting bogged down in all that water back in 2008. He loves the track and with his newfound speed the last few weeks, he’ll be right there on Saturday night. 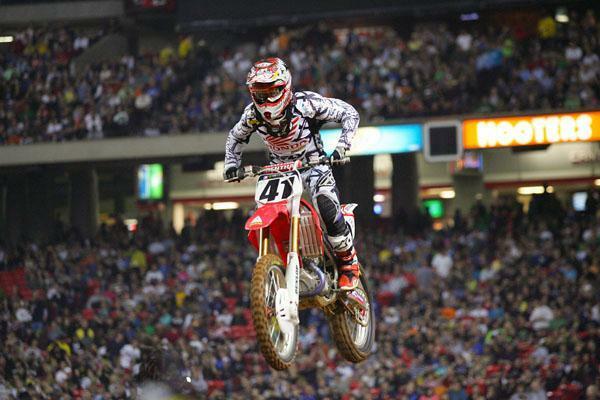 Canard should be in the mix at Daytona after a podium finish last year. Trey Canard has certainly been fast this season, but small rookie mistakes have been hurting him. He’s won a race this year and most everyone would agree that he should have some better results this year if you rated the guys on speed alone. 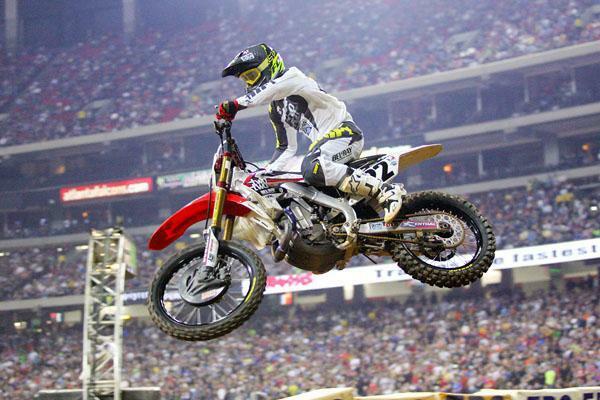 Canard won Daytona in 2008 on a 250F and last season, in his fill-in rides on the Honda CRF450, he made the box with a solid third. You want to make a big splash for the Red Riders? Win the Daytona Supercross presented by Honda on a Honda. Will Dungey get his first win of the season at Daytona. Ryan Dungey is looking for his first win of the year and what better place to get it than Daytona? He’s never won there (second last year and tenth in 2008 when he was part-timer on the 450), but with his fitness, the grassy Florida dirt he’s used to and the fact that the champ has to win at least once race this year, well, doesn’t it seem like he’s due for one here? Let’s do the math here. There have been eight races so far this year, which puts forty top five finishes up for grabs. And through eight races, the five guys above have taken 35 out of those 40 spots. Safe to say these five are the main contenders for the 2011 Daytona SX win. So who’s it going to be? That’s what makes today’s Daytona so hard to figure. In the past you’d start looking at this race as a preview of the motocross season, with riders running outdoor setups and flexing some muscle near the 30-minute mark. Today, it’s still different, but much closer, to a typical supercross. And that’s good news right now, because we’ve seen five riders who are capable of taking the win on any given Saturday. I’m really looking forward to seeing who takes this thing home and if you can’t be there in person, it’s live on SPEED TV on Saturday night. And as good of a season that this has been, keep in mind that’s it only half-way over after this!